Young Gardner Elliot (Butterfield) was born on Mars by accident. In the sort of eyebrow-raising coincidences soap operas typically trade on, the circumstances of his conception mean he can’t come back to Earth (his body couldn’t take it) after his mission commander mother (Montgomery) dies giving birth to him. Growing up with no other children or normal society, just other astronauts, and hidden from Earth, the natural isolation of the teenage years have become not just difficult but actively torturous. His only outlet is an online friend (Robertson) who is preparing to graduate high school and disappear from his life when she flees her Colorado town, giving him a very small window to literally figure out his place in the world. The Space Between Us sounds like your typical young adult novel (though it isn’t), a cloying high-concept melodrama which mistakes sentimentality for actual truths about the human condition. And considering how seriously it takes itself and its job of poking holes in human faults through an outsider’s perspective, that’s a big problem. Gardner exists to ask the audience why they create barriers to enjoying the beauty of life and it’s just as cloying as it sounds. In that sense, it’s right up the alley of director Peter Chelsom (Hector and the Search for Happiness) whose first film, Treacle, pretty much sums up his entire oeuvre: sticky and overly sweet. If he’s not got a strong grip on the heart of his material (like Gardner’s it’s too large and threatening to explode at any moment), he’s produced a slickly-crafted film. Cinematographer Barry Peterson and production designer Kirk Petruccelli have done a lot with a small budget (where planet-spanning effect films are concerned) creating a slick view of five seconds into the future. The clean lines and bright colors match up well with the optimistic and ‘unconcerned with reality’ nature of the story. But no one in the film is doing more with less than young stars Butterfield and Robertson. A romance, particularly a teen romance, lives and dies on the strength of its characters and to call Gardner and Tulsa paper-thin does a disservice to paper. The young actors are fully engaged with each, bringing a tremendous amount of charisma and life to some truly abominable dialogue. Gardner is a literal wide-eyed innocent who asks everyone he meets ‘what’s your favorite thing about Earth?’ and Tulsa a foster child who has received at best indifference from the world around her and is prepared to meet it with the same. They represent the age-old battle between cynicism and optimism squeezed into the bodies of a couple of 20-year olds who aren’t really prepared to have an opinion on either. But stories like Space are for audiences that old or younger who do believe they’ve figured things out and like Gardner can’t understand why no one will listen to them, so in at least that sense they are believable. Worse, it’s all in service of a plot which has to make ridiculous contortions to make room for a late twist which adds nothing but costs a lot. In order to get there, it must obscure who Gardner’s father is, why his existence was hidden from the world or what Mars program founder Nathaniel Shepherd (Oldman) has been doing until Gardner finds his way to Earth. If anything gets abused, more than your sense of suspension of disbelief, it is poor Oldman, who should be the best thing in any movie he is in. It needs enough time to get Gardner and Tulsa to fall in love but isn’t interested in using that time to explore who they are beyond simplistic backstory. The fact that Oldman’s scenes feel like add-ons to the film to keep tension up is testament to how badly constructed Space is. The Space Between Us is the kind of movie where a white girl from Colorado of the future says ‘fronting’ unironically and barns explode like the farmers who own them have been storing all their extra plastic explosive there. There is certainly something to be said for premising a film on outside perspectives to break us out of our patterns. Unfortunately, this tends to get used as an excuse for the most simplistic views of the human condition, one that ignores the complexities of life in favor of easy and easily-digested answers. 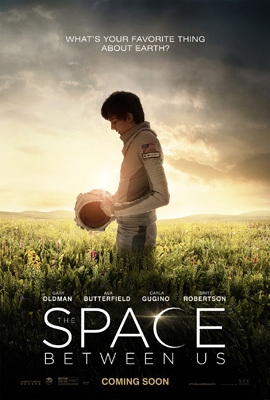 A classic young adult novel story, only without the novel bit, Space has all of the minuses of that particular genre and few of the pluses.